VR training is quickly becoming a powerful tool that can be utilized to improve employee onboarding experiences. In this article, I share 6 tips on how to leverage this technology in your onboarding strategy in addition to discussing the benefits gained by your company. Read now to learn more. There once was a time when the only kind of Virtual Reality training (VR) you could get was learning how to activate your simulated jet pack on your video gaming platform. In the Digital Age, this is no longer true. Companies across the globe are using VR onboarding training methods for their newest employees. By integrating this interactive technology, companies are finding that employees are drastically retaining more of their training. As a result, company production and team collaboration are growing more than ever. The following 6 tips include some clever ways for you to leverage VR Training to create better onboarding experiences. Employee training can cover anything from teaching customer service representatives to educating someone on how to properly operate heavy machinery. By delivering employee training and onboarding through Virtual Reality, employers open themselves up to a world of endless possibilities. Using VR training in customer service is very different from using VR training in machinery. For example, a VR training course in customer service might take employees through simulated conversations with customers. This would provide real-time interaction with a life-like avatar while also allowing the employee to read and hear tips and tricks as they navigate the social situations. VR training for customer service can be used for anything from a phone training to quizzing employees over product benefits and features to helping an employee de-escalate a stressful situation. VR onboarding training for machine simulation is incredibly helpful for boosting a company’s safety. The majority of injuries and accidents that occur in companies come from new employees who are still in the learning curve. However, by training employees on machinery in a virtual setting, employers equip employees to handle their machines in a new way. Not only do VR training sessions allow employees to have reminders of buttons and levers, but they also allow employees to go through repeated, stressful and emergency situations which teach them to respond in the proper way. The VR training system might require the employee to perform a hard shutdown on the machine. The technology may also teach the employee how to perform maintenance on the machine. All of these are crucial onboarding experiences to ensure that the employee can handle the machine both when it is working properly as well as when it is malfunctioning to optimize work safety. Another way to use VR in your employee onboarding process is by taking your employees on virtual tours. This is fantastic for employees who are both onsite and around the world. Perhaps, you are onboarding virtual employees who will only come in the office a few times a year. By taking them through a virtual simulation of the office, these employees will be able to better navigate the office when they come in for the few corporate meetings they need to attend. This is also a way to ensure that your in-house employees are not getting lost on a daily basis for the first month they are there. Virtual Reality can also be used in a cooperative setting, meaning that teams can work together to problem-solve through training exercises. This is fantastic for team building because it will allow team members the opportunity to work together on tasks that they will be expected to complete on a daily basis. This sort of simulation gives them the opportunity to see what their job will be like and see how they can best work with one another. This is also great for building camaraderie among your employees so that healthy team culture is developed early on. Another great use of VR technology for your onboarding process is emergency drills. As mentioned before, Virtual Reality increases people’s memory retention abilities. Emergency procedures are one of the most important things employees must understand from day one because they are unpredictable and unexpected. Walking your employees through simulated emergencies in virtual scenarios will help them to understand emergency protocols so that they and their coworkers will remain safe if they ever are in a threatening setting such as a fire, natural disaster, or hostage situation for example. In addition to the multiple ways you can use Virtual Reality once you have hired someone, VR can be used in finding talent as well. Millennials and Generation Zers are all coming out of university, and they are looking for up-and-coming, tech-savvy businesses. By demonstrating the interactive nature of your training and onboarding process, you show the members of the Digital Age that you are a competitive business willing to stay ahead of the trends. This helps you brand yourself as an expert in marketing as well as a wise business owner because you are looking towards the future, which is where all new graduates want to go. Once you have implemented VR into your onboarding strategy, it is important you measure the effectiveness of your efforts. This comes from detailed feedback, which can be done by evaluating your employees' reactions and opinions, creating assessments on the knowledge application of what was presented in the VR training, or collecting tracking data to see what areas were interacted and connected with the most during the learning process. This feedback can then be used to determine areas of your virtual onboarding process that are having success, and what areas may need to be updated or removed. When it comes to using Virtual Reality for your business, there are many simple and fun techniques that you can implement for more effective results. Virtual Reality training is on the rise as one of the most promising technologies of our time, and it should not be overlooked as a part of your employee onboarding strategy. 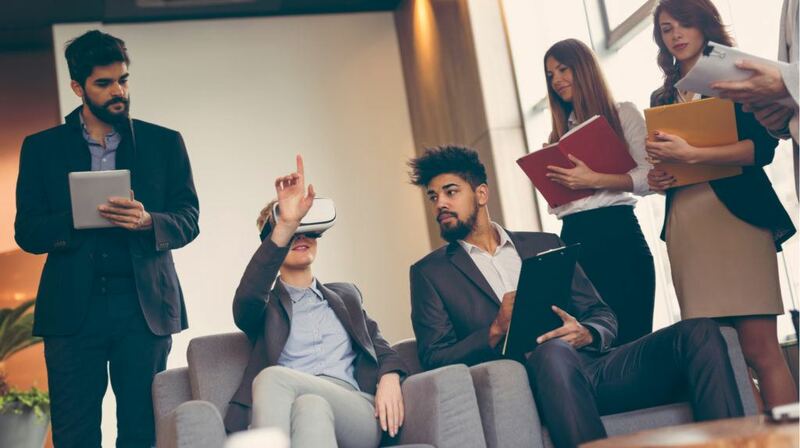 If you have a high number of employees to onboard, have risky or high-cost processes, work with different locations, or want to cater to today’s technology-advanced workforce, consider VR training to help create better onboarding experiences at your company.